Purple Line phase 2 groundbreaking! 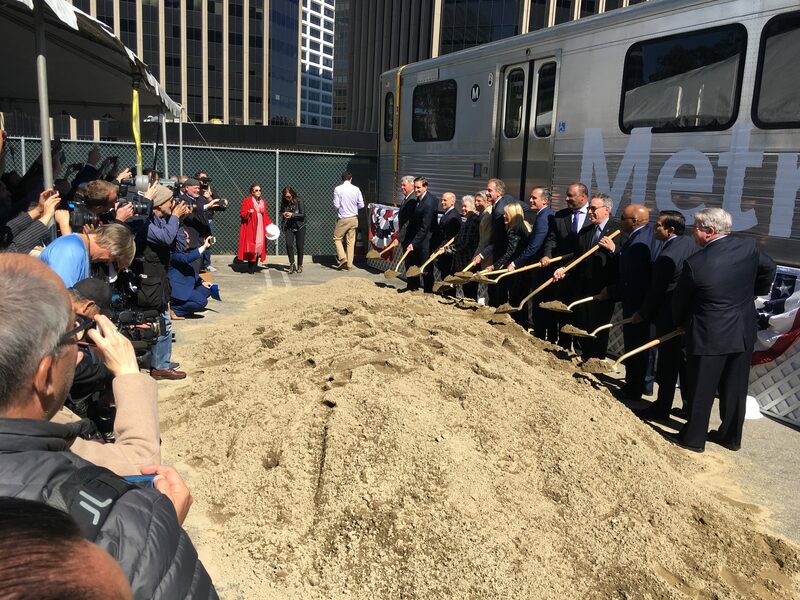 Metro joined local, state and federal officials today to break ground on Section 2 of the Metro Purple Line Extension Project that will add 2.6-miles of new subway service to downtown Beverly Hills and Century City. Metro has begun moving underground water, gas, power and telecommunications lines to make way for future subway construction. The agency is also conducting potholing, geotechnical tests, traffic surveys and other preparatory work. Major construction is slated to begin this spring when work crews create a launch area for a tunnel boring machine at the planned Century City/Constellation Station. Major work at the planned Wilshire/Rodeo Station in Beverly Hills is expected to begin at the end of this year or early 2019. 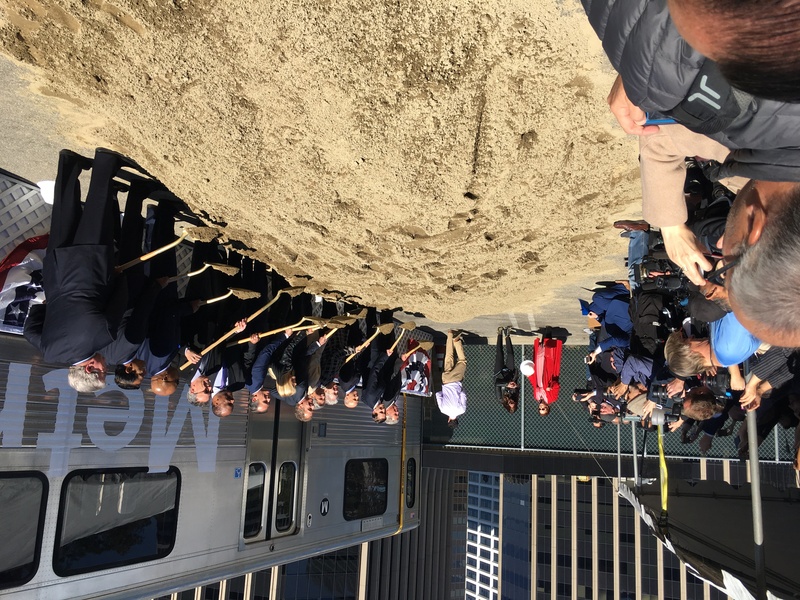 •Metro has already begun construction of the first four-mile section of subway between Wilshire/Western in Koreatown and Wilshire/La Cienega in Beverly Hills. This initial section is now 30 percent complete and is scheduled to open in 2023. Section 2 is scheduled for completion in 2025 and the third and final section from Century City to Westwood/VA Hospital is planned to open in 2026, two years prior to the 2028 Olympic and Paralympic Games. •The Purple Line Extension is projected to generate about 49,300 daily weekday boardings at its seven new stations. There will be about 78,000 new daily trips on the full Metro Rail System as a result of opening the line. Trains are expected to run every four minutes during peak periods and every 10 minutes during off-peak times. It is projected to take about 25 minutes to travel between downtown Los Angeles and Westwood on the subway. •The entire Purple Line Extension project is expected to receive $3.6 billion in federal grants. Metro has established a $2.53-billion budget for Section 2, including $1.5 billion from a federal grant and loan. County sales tax proceeds from 2008’s Measure R and 2016’s Measure M voter-approved transportation measures are providing critically needed local funding to match the federal contributions and accelerate construction work. •A contractor to build Section 2 has already been selected. Metro awarded a $1.37-billion construction contract to Tutor Perini O&G, a Joint Venture, to build the second subway section. •Other major destinations accessible via the Metro Purple Line will include the Los Angeles County Museum of Art, Peterson Auto Museum, the Miracle Mile District, UCLA, and Westwood/VA Hospital. •Below is a video of some of the speakers at Friday’s groundbreaking. Another group of politicos throwing sand in a parking lot in front of cameras. Just hold a press conference at a nearby building. No need to fake a real groundbreaking. Oh, wait, there is! I can get my face in the papers. Theme music for this segment of the Purple Line. By a true LA original. How much would have been saved if the entire extension had been done as one construction package? Is one entrance in Century City is enough? This has the potential for being a popular station. I am pretty sure Westfield was exploring a direct entrance to the Century City Mall as well. Unless the diagram above is not drawn to scale, the station box doesn’t stretch to Westfield property. Correct. During the planning for Purple Line Extension, the decision was made to not build a station at Wilshire/Crenshaw because it was too close to Wilshire/Western and funding was tight. A Crenshaw/LAX north extension would likely swing west anyway to reach West Hollywood and could connect with the Purple Line at other places. We’ll know more once the environmental studies for that project get going. The LAX Line can connect to both the Red and Purple Line via La Brea, Fairfax, and La Cienega you know, all of which are way much better corridors than Wilshire/Crenshaw where. . . Wait, what landmarks/places of interest are at that intersection again? That would make too much sense. Instead, Metro is prioritizing expanding the Gold Line to San Bernardino county where the Metrolink already operates. Crenshaw Line to Hollywood/Vine must wait until we have two different rail options going to San Bernardino. Is that rendering accurate? Only one entrance for the Century City station? Cheap, but not very convenient. Hi Michael and everyone — I updated this on Saturday morning regarding Century City station. The station entrance for Century City will be on the northeast corner of Ave of the Stars and Constellation. The station box is being built to allow Westfield to connect with a station entrance if they decide to. If that happens it would be on the north side of Constellation about midway between Ave of the Stars and Century Park West. Wilshire/Fairfax : The Los Angeles County Museum of Art (LACMA) has indicated an interest in providing a station entrance on the north side of Wilshire Boulevard directly across from the one planned for the northeast corner of Wilshire and Orange Grove. Hope this helps explain it better! Is the federal funding for section 3 still uncertain, what with the latest government decisions on infrastructure spending? If you want to advertise nearby destinations, La Cienega has its restaurant row just north of Wilshire. I would think it still might have some worthwhile places 7 years from now. Also, not that it means much, but by 2028 you’ll now have two rail lines with stations right next to Olympic Blvd. The agency is still trying to finalize the federal grant for Section 3. The issue is that the White House does not want to fund any new projects and section 3 is considered a new project even though it’s attached to two projects (section 1 and 2) that already secured funding. Can the same boring machine be used for any of the three sections needed to build the line? Each contractor is using their own tunneling machine for each section. It’s actually good to have many TBMs on a project, because tunneling only completes about 15 meters a day, max, using only one or two tunneling machines forces a project to take much longer. The ten-twenty person crew manning the machine would love to have a guaranteed job for much longer, but it saves time and money to have multiple crews, ideally working simultaneously. The money spent on more than one pair of tunneling machins is more than made up for in labor and time savings. All around the world, the best practices to keep construction costs low is to use as many tunneling machines as the budget will allow. And the biggest money saving would be found if for metro would admit they speak Spanish and this could incorporate everything Spain knows about tunneling. Barcelona in particular is the best at controlling construction costs while also delivering best in class outcomes at excellent speed. But since he metro brass or metro consultants only speak English, they will probably only compare to London and New York (Dey speaka da English there!) which means they will not learn how to do it right, fast and cost effectively, they’ll just learn how to do it with the worlds worst methods in all of the above. And if you’re really worried about costs, metro probably spends a couple hundred million annually on “consultants” which are a bunch of overpriced know nothings whose work could easily be done cheaper if metro wanted to staff the expertise in house. But consultants are politically connected so we have to have them, how else would the politicians buddies get their cushy jobs paying millions of dollars. That “Rodeo Dr.” station is so far from the actual Rodeo Dr. that they should just call it “Downtown Beverly Hills” and be done with it. That makes sense. Also gets rid of another station title with “Wilshire” in it. On the other hand, Steve,, funds must have been abundantly available to have built the Normandie Avenue station which is ridiculously close to both the Western Avenue and the Vermont Avenue stations! Nowadays, the Normandie station would likely not been built. That said, if Metro eventually separates the Red and Purple lines (with Red continuing south down Vermont), Normandie could provide local stress relief for Wilshire/Vermont transfer crowds. Will the extension to La Cienega be operational before the next phase begins? If so, do you think it will be before the projected date? If Decking is done, couldn’t it be completed sometime this year? 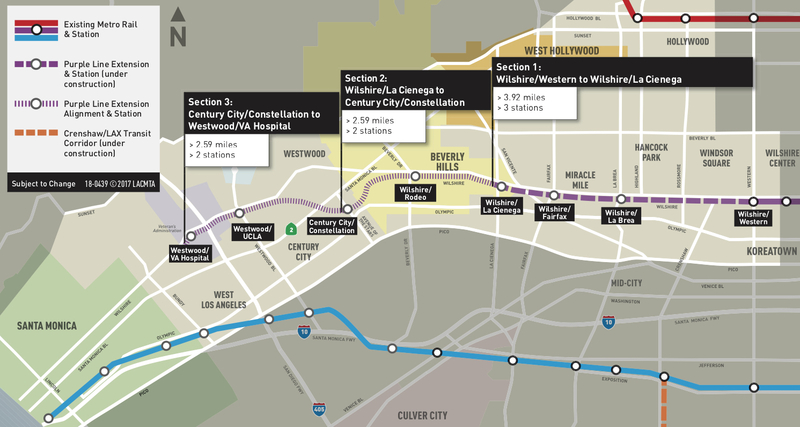 The first section to Wilshire/La Cienega is projected to open in 2023 with the segment to Century City in 2025. Thanks. My question was do you think it will be done BEFORE the projected date? If they’re ahead of schedule will the open early? How far along are they? It certainly could happen and sooner is always better than later but our construction folks are pretty good with projections on when the work will be done. And there’s a lot of work to do. When you’re down in the station boxes and see the size of the things it really brings home the effort it takes to build one of these. The pics in this post are a few months old now but if you haven’t seen them, you might enjoy — from the Wilshire/La Brea station box.